This entry was posted on Thursday, December 29th, 2011 at 07:00 and is filed under Barack Obama, Congress, Gun Rights, Law, News, Politics. Laws Are Made to be Broken? There is a provision of the Omnibus spending bill passed by Congress before the Christmas recess that prohibits the expenditure of funds for use in the advocacy or promotion of gun control. 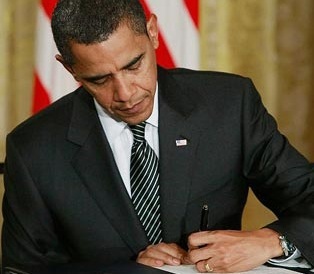 In his signing statement, President Obama effectively said “to heck with that,” and said he would do whatever he deems “necessary and expedient.” This is the behavior of a President who when campaigning for that office said that signing statements of this sort are unconstitutional, and that as per the constitution, the law signed is the law enacted irrespective of a contradictory signing statement. I suppose we can file that one alongside his promise to be “the most transparent administration in history.” This provision was to apply to the National Institutes for Health, the Centers for Disease Control, and other health-related federal agencies. This is simply another instance of President Obama’s willingness to ignore the law, even laws he signs, and it’s a disturbing trend we mustn’t ignore as we stand now just more than ten months from a Presidential election. This continual imposition of his will in opposition to the law is becoming an epidemic. He’s taken similar steps with other provisions of law via executive orders and regulations, and as you will remember, the entire Fast and Furious debacle was undertaken to give him statistical justification for those regulations. If he’s re-elected, this will only grow worse, and we will be under his regulatory boot through January, 2017. It’s time to make this President a one-termer, and send him home. It seems that congress does not matter , Oboma does what ever he wants when ever he wants , seems like he has to much power , we didn't give him that so how did he get it ? Laws don't matter to him . "He has forbidden his Governors to pass Laws of immediate and pressing importance, unless suspended in their operation till his Assent should be obtained; and when so suspended, he has utterly neglected to attend to them." "He has erected a multitude of New Offices, and sent hither swarms of Officers to harrass our people, and eat out their substance." "For suspending our own Legislatures, and declaring themselves invested with power to legislate for us in all cases whatsoever." "A Prince whose character is thus marked by every act which may define a Tyrant, is unfit to be the ruler of a free people." For these and other egregious acts, they formally declared independence and dissolved "…the political bands which have connected them with another…"
How far we've progressed in these 235 years. Thomas, sadly, that's all true, isn't it? Or as the saying goes: The more things change, the more they stay the same.